A mailing list by zip code is a list that contains mailing addresses in a specific zip code or zip codes. If you’re looking to send a direct mail campaign to specific zip codes, then you’ll need to get a mailing list by zip code. 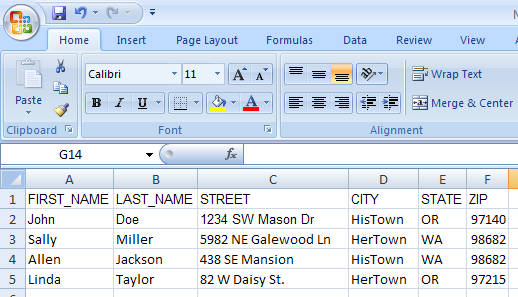 A mailing list by zip code is normally in an Excel or CSV file format that contains residents’ names and mailing addresses. There are many different types of mailing lists by zip code. Do you want to mail to every Consumer/Residential household in certain zip codes? Or do you want to target Businesses only? Or do you want to target all addresses in certain zip codes? Do you want to target specific types of people by using demographics like Age, Income etc? How much does it cost to purchase a mailing list by zip code? Where can you purchase a mailing list by zip code? A Consumer mailing list by zip code includes residential names and mailing addresses in a specific zip code or zip codes. A Consumer mailing list will not contain any Business mailing addresses. The benefit of using a Consumer mailing list by zip code, is that you can target specific types of people in a zip code, so that your mailing campaign only reaches the people who are most likely to want your service/product. Example: You own an upscale Women’s Hair Salon. If you send your Postcard mailing to every household then your advertisement will reach a lot of people who are unlikely to visit your salon. So instead, you may want to consider targeting a smaller, niche group of people who are the best prospects for your business, such as Women with a middle-high Household Income. As a result, your ad / offer will reach the perfect prospects; Women with a household estimated Income that is high enough to afford your services. Consequently, a more targeted mailing list can help increase your potential return on investment by ensuring that everyone receiving your ad/offer, is a likely potential new customer. A Business mailing list by zip code will include business mailing addresses in a specific zip code or zip codes. A Business mailing list will not contain any Consumer mailing addresses. If you want to advertise to Businesses in your area, you could target all Businesses in a certain zip code, or you could narrow down and target certain types of Businesses. With a Business mailing list, you can target Businesses by Industry and Standard Industry Codes (SIC). You can also narrow down by using Demographics like Number of Employees, Annual Sales Volume, Number of Years that they have been in business etc. Consequently, if you use a targeted Business mailing list, you can make sure to target specific types of businesses that are your best possible prospects. How Much Does it Cost to Buy a Mailing List by Zip Code? Where Can I Get a Mailing List by Zip Code? There are several companies that sell mailing lists by zip code (including our company, LeadsPlease). If you google ‘mailing list by zip code’ you will see several companies that show in the results. How often do you clean and update your mailing lists? Are your mailing lists accurate? How much does your mailing list cost? If I’m not happy with my mailing list, what will you do to help me? LeadsPlease mailing lists by zip code are updated every 30 days and daily as new information becomes available. We boast a 95+% accuracy for our consumer mailing lists and a 90+% accuracy for our business mailing lists. Most importantly, we want you to be happy with your mailing list. If you’re not happy with your mailing list, for whatever reason, we’ll work with you to replace it or refund you.